Raymond Laurenzo. 91, of West Warwick died Saturday at Kent Hospital. He was the beloved husband of the late Josephine R. (Carnevale) Laurenzo. Born in Providence, a son of the late Paolo and Palma (Lomastro) Laurenzo, he had been a resident of Johnston for thirty-one years before moving to Coventry in 1998. Mr. Laurenzo was an auto mechanic at Benny’s Automotive for fifty years before retiring in 1993. He was a church usher and member of the St. Bartholomew Church Holy Name Society for over fity years. Mr. Laurenzo was a WWII Army veteran serving with the occupation forces in Japan. He enjoyed classical and Italian music. He leaves a son, Raymond P. Laurenzo and his wife, Marcia of West Warwick; two grandchildren, Raymond J. Laurenzo and his wife, Amy of West Warwick; Kaile A. Laurenzo and her fiancé, William Floster of Myrtle Beach, SC; a great granddaughter, Emma Grace Laurenzo. He was the brother of Edward Laurenzo of Florida, Paul Laurenzo of Warwick and the late Alfred Laurenzo. 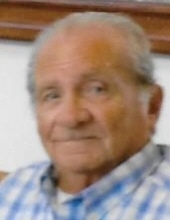 His funeral will be Wednesday at 8:30 A.M. from the Frank P. Trainor & Sons Funeral Home, 982 Warwick Avenue, Warwick. Mass of Christian in Saints John and Paul Church 341 S. Main Street, Coventry at 10 AM. Calling Hours Tuesday 5-8 PM. Burial with military honors will be in Saint Ann Cemetery, Cranston. www.trainorfh.com. To send flowers or a remembrance gift to the family of Raymond Laurenzo, please visit our Tribute Store. "Email Address" would like to share the life celebration of Raymond Laurenzo. Click on the "link" to go to share a favorite memory or leave a condolence message for the family.